My granddaughter Emma (and her mom Anne) have been staying with us here in Big Rapids for a while, and it has been great, so perhaps a little update on the girls is in order. One of the places Emma likes to hang out is our meditation area, which we call the "Shrine Room," a separate building here. Most often she goes out there with Grandma and has a blast. Not sure who took this photo, but it probably was her mom. 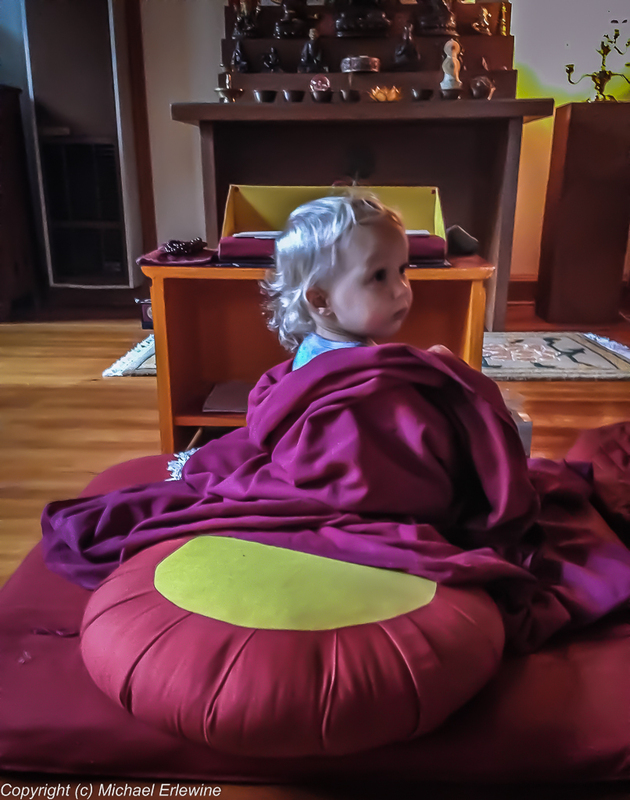 Here Emma is sitting on Grandma's Zabuton (large square mat) and leaning against the smaller round Zafu cushion. Of course she has Grandma's shawl around her. There are ever-so-many things to wonder about and get into in the shrine room. Emma loves it out there. She likes to hit the big hanging drum. Meanwhile Emma's mom, who is a graphic artist, has been using our matting and framing facilities and painting like crazy, getting ready for a show at the Harvest Gathering and (I believe) some galleries elsewhere. I posted a photo of one of Anne's paintings yesterday, which you can check out. Anne is a well-known muralist here in Michigan, having done huge murals at colleges and other places. Emma, who is about 20 months old, is beyond childproofing. By that I mean, no amount of childproofing can put off Emma because she will just push a chair to where she wants to get and climb up on it. Our kitchen table has all of the chairs lying on their sides to keep Emma from standing on the table. She keeps all of us hopping and baby gates hold key positions around the house, the last defense against an Emma invasion. One baby gate blocks Emma from the back room, what here in Michigan we call the mudroom. It is where the washer and dryer are, and Emma likes to push all the buttons on those machines. But most of all she delights in crawling in and out of the dog door into the back yard, when she can manage it. This requires supervision on our part. Another baby gate is across my office door. I take it down when I am not busy and my office is often the first place Emma goes when she comes over from our center next door where she is staying. She wants to see Grandpa because I am always doing interesting stuff in her eyes. Sometimes I won't let Emma in, and she stands and calls to me from behind the gate. If I still won't let her in, she starts to throw things over the gate and into my office, like the various soccer balls and stuff that are there right now. Emma loves to wash dishes and frequently there she is, standing on a chair pushed up to the sink, with her hands in the water. Most of the lower cupboards are childproofed (she can't open them), but a few of them are open to her, mostly pots and pans. Emma very carefully empties them out onto the floor and puts them back in again…. or we do. Emma's mom Anne has a full-time job just being a mom, and it is hard work with very little rest. Recently Emma's Grandma has volunteered to take Emma each day for one-and-one-half hours. The thought even scares me. Thank you Grandma! So there you have a brief update on the life and times of Emma. She and her mom bring life to what otherwise would be a very quiet place. Thanks girls!